Being a part of more forums and online communities than I care to admit has certainly allowed me to become more familiar with the idiocies of human behavior. Particularly when that behavior occurs under the assumption that anything goes. Online, some people decided that the rules of conduct we observe in real life do not apply. Thus, these same individuals terrorize our inboxes, hijack our discussions, and flame us whenever they feel like it. 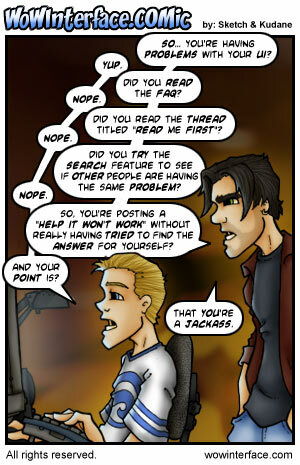 They are sometimes known as jackasses, as in the comic above (via WoW Interface). You may even go so far as to call them, online terrorists. Or net terrorists. How about Neterrorists! Yes, I think this shall be my new term for them. I still believe... that we... will prevail... in the war against Neterror!